optional module "Maxim DL/CCD" incorporating the control of CCD imaging cameras and their most popular accessories (color filter wheels, etc.). "Quick Fringe" interferogram analysis software designed for scientists, engineers and technicians who need powerful yet easy to use fringe analysis capability. Features include direct video frame capture and automatic fringe tracing for rapid analysis. Determine peak-to-valley and RMS aberration. Subtract tilt, power, astigmatism, coma and spherical aberration at the click of a button. The importance of astronomical CCD image processing software products first came to the eye of the general astronomical community with the introduction of the revolutionary predecessor "Hidden Image" software. Developed by Ajai Sehgal - popular during the mid 1990's when the amateur and professional astronomy communities experienced the dramatic growth of CCD imaging technology. 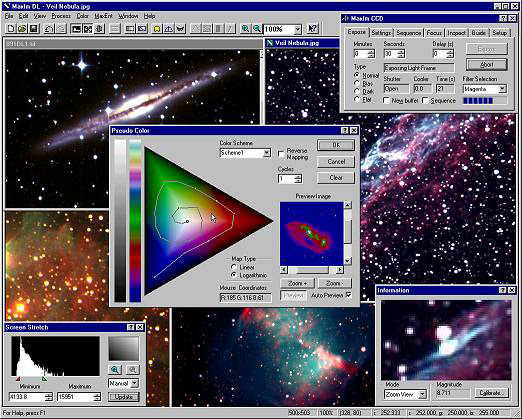 This first serious astronomy oriented CCD image processing software program included the advanced "Image Deconvolution Algorithm" and "Fourier Transform" processing functions among their many other menu items. It is only now that personal computers incorporate the processing power and memory necessary to really make these functions scream! Cyanogen software components have been developed by a staff who include people experienced in the development and operation of image processing and analysis software at the cutting edge of technology. Lessons learned from the defense and intelligence applications, as well as astronomy and less common institutional and industrial applications has been brought to bear to gradually refine and expand the capabilities of this software. Ceravolo Optical Systems - a manufacturer of custom optics and high end astronomical telescopes. Products include specialized industrial laser optics, compact laser interferometers, and Maksutov-Newtonian telescopes. COS President Peter Ceravolo is well known for his innovative designs and commitment to quality. Diffraction Limited - an engineering company specializing in electronics and software design. Software products include MaxIm DL image processing software, MaxIm DL/CCD camera control software, and Quick Fringe interferogram analysis software. Engineering services include development of sensors for aircraft engines, helicopter navigation systems, and consumer protection devices. Company President Douglas George is an experienced Professional Engineer with expertise in analog system design, digital signal processing, and software engineering.